The ghpsdr project, which in its most recent incarnation is known as ghpsdr3-alex, is an SDR project with its roots from the HPSDR working group. 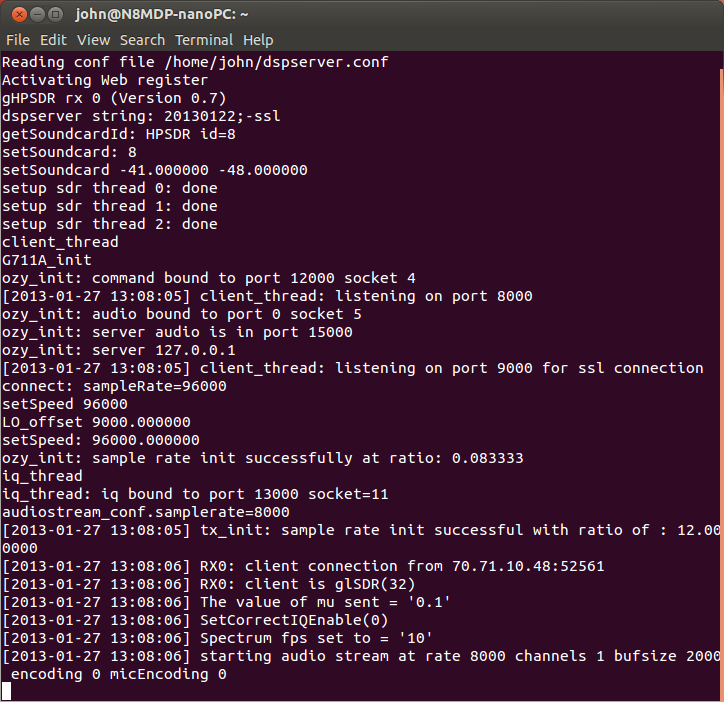 ghpsdr3 is a software defined radio server/client or server/dspserver/client format program written specifically for HPSDR by John Melton, G0ORX/N6LYT. 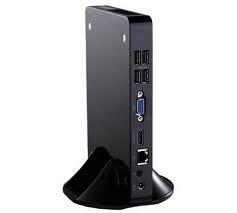 The software was being developed on the Ubuntu version of Linux (specifically version 9.10). 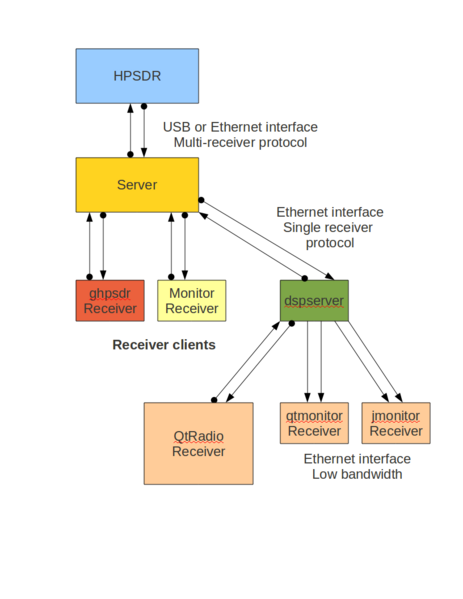 Like HPSDR, ghpsdr3-alex uses a remote-server topology, so that the receiver and user can be separated in space, and connected only by the internet. 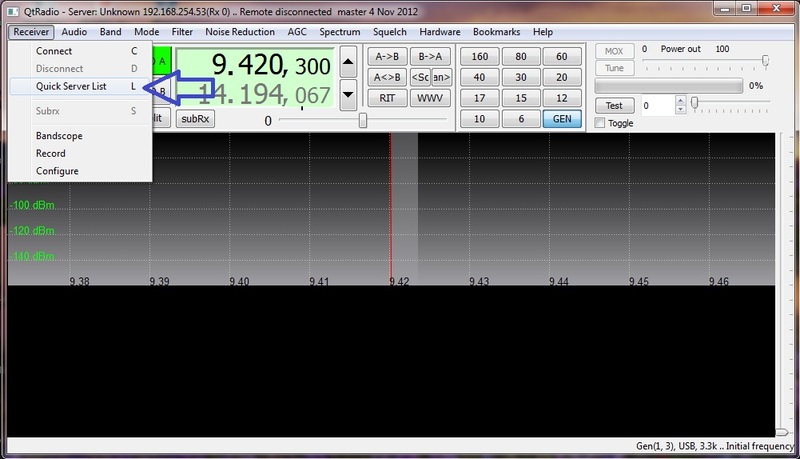 I use the ghpsdr3-alex software to serve my Softrock Ensemble II SDR. Installation of the ghpsdr3-alex software has a bit of a learning curve, but once you do it the first time, it really is not that bad. As the software is updated from time to time, the installation is much easier. Since I was a newbie with Linux as well, I would like to offer a few hints aimed at newbies who are just getting started with this. They are a supplement to and NOT a replacement for the excellent instructions on the main ghpsdr3 page. Also, you should have a reasonable understanding of how the Ubuntu (Linux) operating system works. If you don't, this process might be a bit confusing for you. Best to grab a good book on Ubuntu or Linux. Since I have a Softrock, my hints here are for a Softrock installation. Best to read through the ghpsdr3-alex pages to install for other SDR's that the software supports. One prerequisite to using the Softrock with ghpsdr3-alex is to make sure the USB driver is set up for the Softrock. I discuss this in great detail in my Softrock on Linux page. Please read through this and complete the installation. It is not necessary to install Quisk. For this project you will want to use the following ghpsdr3-alex project components (all of which are contained in the ghpsdr3-alex git distribution). I'll explain these details after we have the software installed. Note that both here and below where you see -- there are TWO hyphens, not one. The --lo 9000 sets the local oscillator offset value. In my case, I set to 9000Hz so I am 9kHz up from the Softrock's local oscillator frequency. Once the install is complete, again, you can check the version by typing into a Terminal windows: cmake --version. You can now start the codec2 installation. 1. Make sure you follow the following commands per the instructions on the QtRadio Installation page. I also recommend that you perform these additional steps. According to the QtRadio Installation instructions, on some variations, codec2 files will not be detected as installed correctly. There is mentione that there might be build errors citing codec2 are encountered during the later ./configure steps. My friend, W8NFT, Doug, recommended that you do this since he had to do this on his pcDuino3 setup. After the installation, you should have something installed in the /opt/Qt5.0.0 folder. • if you want to make permanent it, you have to add the export into the right configuration shell, suitable for the shell that you are currently using. Up to this point in the documentation, you can go on to build QtRadio. Feel free to do so and follow the instructions precisely. For me, I chose to stop here in the documentation because I also wanted to build up the softrock server, dspserver, and QtRadio together. So let me walk you through the next steps. Once this is completed, you can skip the codec2 installation since you already completed that. Now we can move on to building the master branch. This branch is the latest code that contains both RX and TX capability. My softrock does not have TX capability, so I am not going to worry about that. Create a new directory or cd to the ~/src directory created for libevent and cd into it. And that should be it for the main software components. If you are building any of the other server types, continue to read the QtRadio instructions at the QtRadio Installation page. There is one more critical piece of software that you need to install. And that is the Pulseaudio. PulseAudio is a sound server, a background process accepting sound input from one or more sources (processes or capture devices) and redirecting it to one or more sinks (sound cards, remote network PulseAudio servers, or other processes)Without this Pulseaudio setup, the Softrock will not get the audio out to the Internet. Believe, I found this out the hard way!! Choose your Soundcard for IQ processing. For the Softrock Ensemble, your settings should at least look like the following pictures. I have to use the microphone input since there are no standard Line In jacks. For those of you who do have a TX Softrock version, make sure not to set the RX Audio level in the Recording Tab of pavucontrol to 100%. 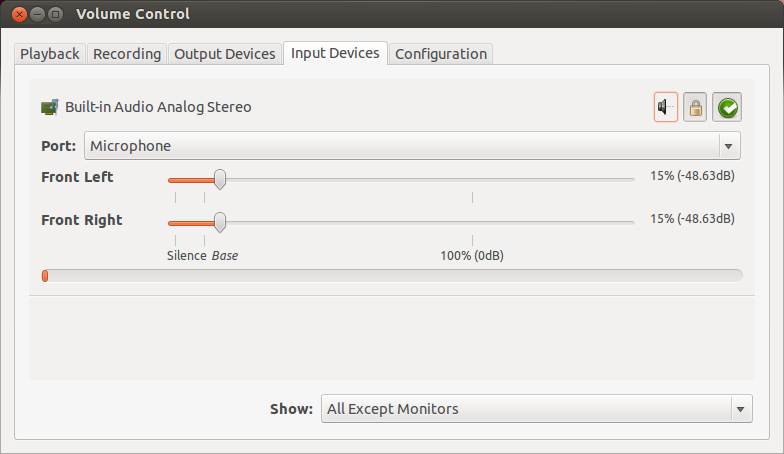 Otherwise you could have audio feedthrough from RX to TX and a distorted TX Audio. A level from 22% - 80% would be ok, but may vary on each system. If everything has intsalled to this point without any errors, congratulations. Trust me, this was a learning process for me and I had errors. So I hope this helps in getting you to this point. 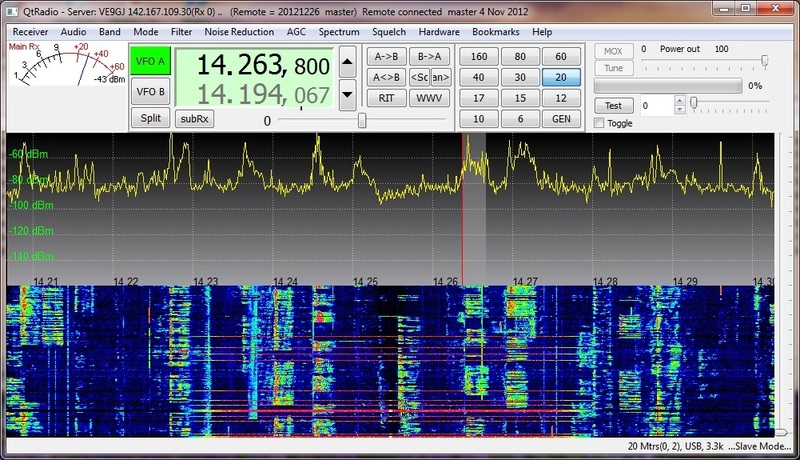 Before I get to the launching of the Softrock server and the dspserver, QtRadio was also installed. 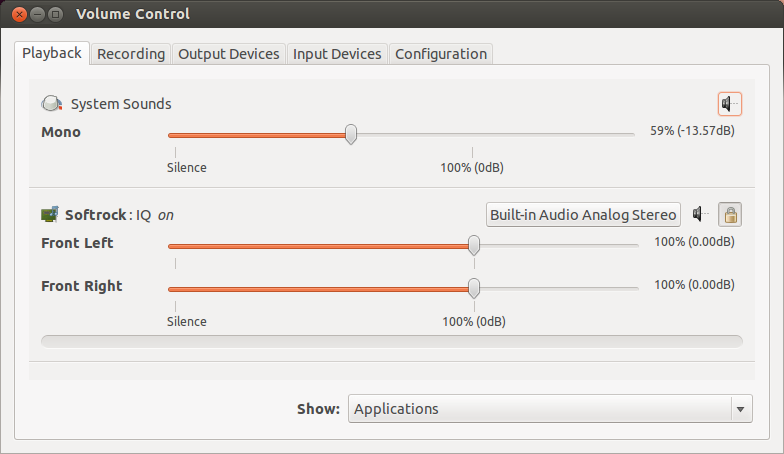 There are two ways to start QtRadio for Ubuntu. 1. Open a Terminal Window (Ctrl-Alt-T) and type 'QtRadio'. It is case sensitive so make sure you type a capital Q and R.
2. 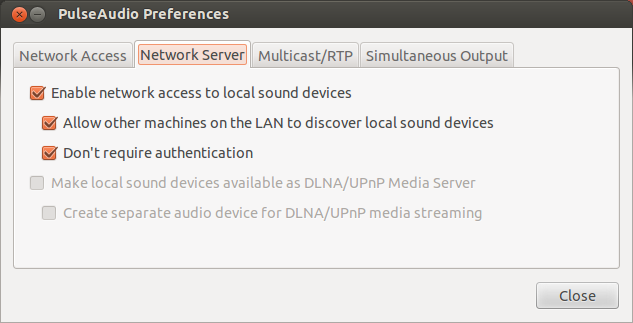 If you are using the Gnome Classic desktop, QtRadio can also be launched from: Applications ==> Internet . QtRadio is one of the options for me to run. Go ahead and select one of the servers and hit Connect. You will then be connected to that SDR. Enjoy! Now that you have a taste of how QtRadio works, let's fire up the Softrock and get it to serve to the world. 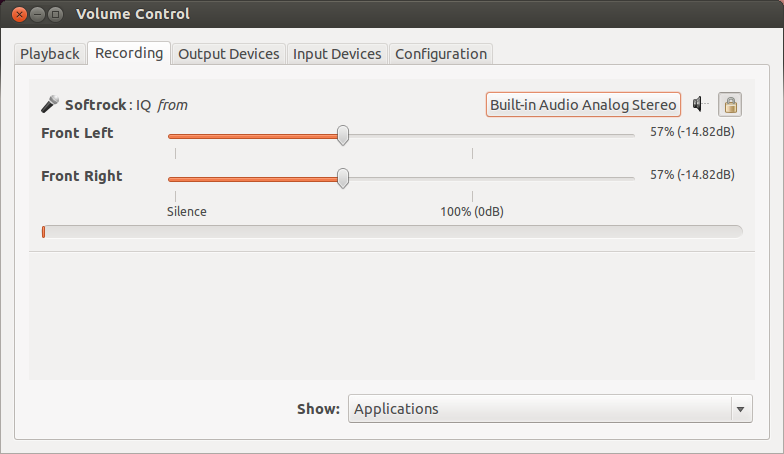 Make sure you change this to the sample rate that your sound card supports. Mine was 96000. Save the file when you complete the edit. You may need to restart the computer for the change to take affect. The LO offset can be set by the --lo argument. For fixed crystal Softrocks and DDC rigs, use --lo 0. For si570 controlled Softrocks, like the Ensemble II, the usual offset should be set with --lo 9000. Of course, you can set other offset values depending on your rig. You will need to restart the dspserver for changes in the dspserver.conf file to take affect. If you have followed these steps to this point, and have launched the Softrock server and dspserver, then your Softrock should now be on the air. 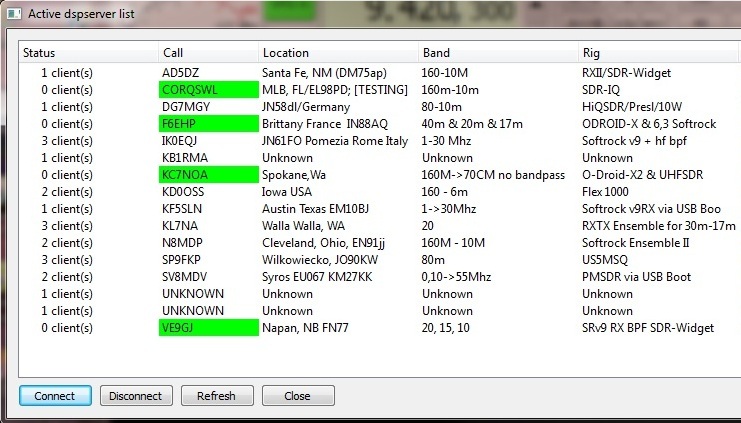 You can verify that it is operational by opening QtRadio. You will need to select Receiver ==> Configure. 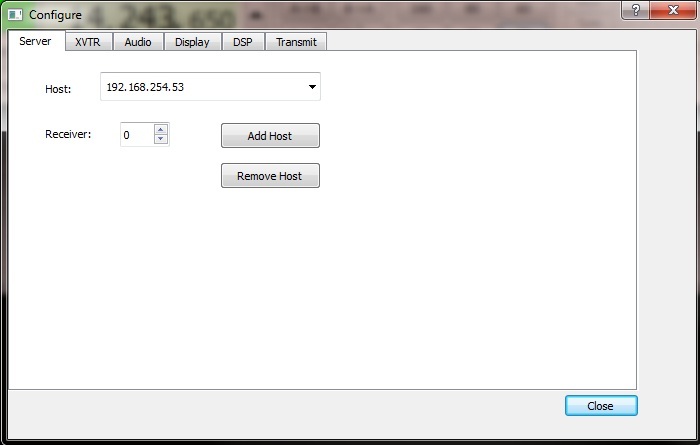 In the following window, enter the local IP address of your Softrock server in the "Host:" window. Hit close when you are done. Then go to Receiver ==> Connect to connect to your server locally. If you begin hearing your Softrock and can control it with QtRadio, congratulations! You have successfully installed the necessary elements. If not, go back through the steps and make sure that you did not miss anything.